A good friend sent me this recipe and the original post says that this recipe will change your life. Living in house where I am the only one that likes pumpkin, it's not that life changing BUT it is still a wonderful recipe! I took these into work and we all loved them! 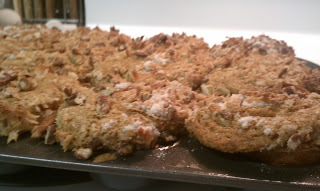 The muffins have a cake like texture but are still moist and the cream cheese just adds a little something to them. Preheat oven to 350 degrees. Sift together flour, baking soda, cinnamon, and salt in a bowl. Set aside. In another bowl, combine eggs, sugar, pumpkin, oil, and vanilla. Mix well. Mix in dry ingredients, stirring until moist. Beat cream cheese until smooth. Add egg and sugar. Beat until well mixed. Combine all topping ingredients together. Spoon batter into 12 muffin cups until about half full. Spoon about 1 tablespoon of cream cheese filling on top. Fill muffin cups with remaining batter. Muffin Cups will be extremely full. Spread batter to edges of cups. Sprinkle generously with topping. Bake for 20 to 25 minutes and let cool. Enjoy!